TruSilver Bezel Twist Mother's Ring with Citrine. 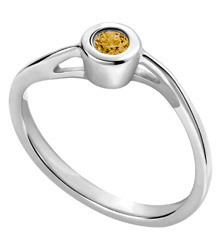 This beautiful TruSilver bezel twist Mother's ring holds one 3 mm citrine. Part of our new designer line, this ring is made from Harmony Metals and is available in sizes 5 through 7.